We talk with Marceline White, executive director of the Maryland Consumer Rights Coalition, who makes the case for putting the teeth back in Carl Stokes’ bill. 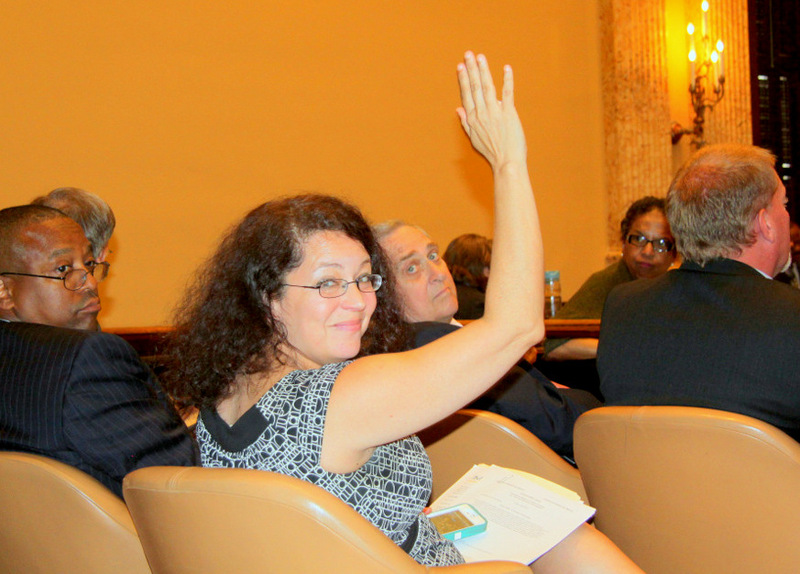 Above: In a roomful of lobbyists supporting amendments to water down the Baltimore “Ticketmaster bill,” Marceline White was the only one there to oppose them. The original bill, introduced by Councilman Carl Stokes, would have set up a tiered system to cap “convenience” and other fees charged by ticket vendors. A 15% cap would apply to the first $50 of a ticket’s price, then 10% would be the cap for the next $50 to $100, and 5% for extra amounts beyond that. Do other jurisdictions have this sort of limitation? NORTH CAROLINA – Similar to Baltimore’s original anti-scalping law and the bill submitted by Councilman Stokes, they cap service fees at $3 per ticket. LOUISIANA – Their law says that tickets cannot be sold for more than the face value of the ticket except when sold over the internet. They do not cap the fees from internet sales but prohibit fees in other instances. MASSACHUSETTS – Their law states that resellers cannot charge more than $2 above the face value price unless that extra amount covers “costs. . . related solely to the procuring and selling of such ticket or other evidence of right of entry and not related to the general business operation of said licensee.” The language, in effect, prohibits Ticketmaster or other ticket agents from charging fees not directly related to the cost of the transaction. NEW JERSEY – They limit the amount someone who is not a ticket broker can charge above the face value of the ticket to the greater of $3 or 20% of the ticket price. NEW YORK – They set the price of reselling a ticket at 45% of the face value if the venue seats more than 6,000 and 20% of the face value if the venue is smaller. RHODE ISLAND – Their law states that ticket sellers can charge no more than $3 or 10% of the face value of the ticket, whichever is greater. Councilman Stokes’ original bill was consistent both with the approaches that other jurisdictions have taken and with the original 1948 anti-scalping law, which was enacted to protect Baltimore residents from costly fees. The bill as amended in committee eliminates all price protections for city residents. What kind of fees are local sellers adding to ticket prices now? With no sort of cap in place in Baltimore, does this really mean any ticket seller can add 40% – or more – to a ticket’s base price? Yes, that is exactly what it means. MCRC looked at the percentage that Ticketmaster and others added to the face value of the ticket on several different musical acts in different venues in Washington D.C., Baltimore, Philadelphia and Pittsburgh. We found that service charges added anywhere from 14%-37% to the cost of the ticket. And one of the things that is so frustrating to consumers is that there is seemingly no rhyme or reason for the price differences. To illustrate, MCRC priced tickets to Michael Buble in both Washington and Philadelphia. If I purchased a $115 ticket to see Michael Buble at the Verizon Center in Washington, service fees would add another 17.5% to the ticket price. In Pittsburgh, a $115 Michael Buble ticket would cost the buyer an additional 19% in service fees. However, a comparable $115 ticket to see Michael Buble at the Wells Fargo Center in Philadelphia, would add 26.9% in service fees to the cost of the ticket. Here are some of our questions: With ticket costs so static, why do the fees range so much? Why does it cost four times as much to process the purchase of four tickets than to purchase one? And why do the fees vary for different artists playing the same venue? What’s an example of a local ticket and fee that illustrates how high these charges can go? A $12 ticket includes $7.90 in service fees at a small venue in South Baltimore, which adds 66.3% to the price of the ticket. Aren’t Ticketmaster and companies like it providing a service in exchange for these fees? Certainly, ticket sellers provide a service. Moreover, I believe that ticket sellers should be paid and earn a profit from the service they provide. When Ticketmaster first began, they had to invest in research, development, and the installation of appropriate technology, internet and web interfaces to sell tickets. But the company earns more than $889 million today and has recouped their original investment many times over. The costs today to process a ticket are static, yet the service fees are exorbitant and vary wildly. These fees are not the cost of doing business-they are the costs Ticketmaster thinks it can levy on consumers to increase its bottom line. Other ticket sellers are providing the same service for between 3.5%-5% of the face price of the ticket. Are these companies just more efficient than Ticketmaster? Or is there something else driving Ticketmaster’ s pricing policy? Are there other alternatives to Ticketmaster? There are ticketsellers that don’t charge the outrageous fees that Ticketmaster does. Tixato, for example, charges 1.9% of the ticket plus a $0.99 service fee. Credit card customers pay an additional processing fee, plus 32 cents per transaction. Therefore, Tixato’s online customers pay about 5% in service fees. Brown Paper Tickets charges a 3.5% service charge plus a 99 cent fee. We found that Ticketfly service charges range from 12.6%-14.4%. These fees would have fallen under the fee cap in the original Stokes’ bill. These ticket sellers pride themselves on providing service in a way that is transparent, affordable, and easy-to-understand. Their pricing policies are clearly laid out on their websites and when a ticket is purchased. It’s unfortunate that these smaller providers have to compete with such a massive, monopolistic entity like Ticketmaster. So, is Ticketmaster/LiveNation a monopoly? Ticketmaster has long dominated the ticket sales landscape. However, in 2010, Ticketmaster merged with concert promoter Live Nation. This merger took place despite fears that it would allow one corporation to control too much of the concert experience. Today, Ticketmaster/Live Nation control all aspects of the concert business including managing artists, promoting them, selling tickets, beer, and parking and putting out albums. Can you explain how these corporate relationships affect consumers? This vertical integration is a way to drive rivals out of the market by controlling the inputs (venues, performers, tickets). Since the merger, Ticketmaster/Live Nation uses its contracts with venues, management of a number of high-profile performers, ownership of most of the amphitheaters and a major number of club venues in the country to prevent competitors from entering the market and to set high service fees and prices for shows. Ticketmaster/Live Nation diminish competition by controlling these assets and making it more difficult for others to enter the market. Allowing Ticketmaster to continue to dominate the ticket-sales landscape is anti-competitive. In a free market, competition can reduce prices. Fee caps would have leveled the playing field a bit for new entrants and smaller players to capture more of the market. Instead, the City Council bill (as amended) reduces competition and supports Ticketmaster’s dominance. What’s the worst-case scenario if the city approved a fee cap – that Ticketmaster’s services would be too costly for venues? Venue-owners seem very pessimistic about the ability of Baltimore to draw top-notch performers without allowing unlimited fees. I’m not. Baltimore is a dynamic city that many performers would want to play. Ticketmaster’s services aren’t too costly for venues – Ticketmaster/Live Nation own or have contracts with many of venues where they book performers. Opponents of the original bill argued that the fee caps would make it too unprofitable for Ticketmaster/Live Nation to book performances in Baltimore. Instead, performers would choose to perform in a venue without service fee caps. But this would be a case of cutting off one’s nose to spite one’s face. Both small venues exemplify best practices and stand in sharp contrast to the opaque notes about ticket costs and service fees found on the sites of larger venues. Since Ticketmaster/Live Nation own many of the venues, they have to book performers into the venues. But performers, venue owners, promoters, and Ticketmaster all negotiate their fees and the performer’s ‘guarantee.’ It may mean that venues might have to engage in stronger negotiations. It may be that some performers would pass on Baltimore, I can’t say that it couldn’t happen. However, the D.C. City Council recently passed a living wage bill for city residents even though it meant that Wal-Mart may not open stores in the city. Sometimes Council members have to make difficult policy choices and put the needs of working families ahead of corporate interests. Baltimore arts institutions and others said the bill would hurt them – would it? Proponents of the weakened bill also indicated that a number of beloved institutions and cultural events would be negatively affected if the pro-consumer bill had passed. I’m happy to say that this is not the case. Many of Baltimore’s most exciting and established arts and culture organizations deliberately partner with ticket sellers that keep costs down to make sure that the events are affordable and accessible for a variety of arts and culture fans. The National Aquarium adds $1.95 in fees and would not be affected. The Baltimore Symphony Orchestra adds $4.00 handling fee and would not be affected. Port Discovery, Walters Art Museum, Baltimore Museum of Art, Single Carrot Theater, Annex Theater, the Yellow Sign Theater, Baltimore Rock Opera Society, High Zero Festival, the Theater Project, and the Maryland Zoo would not be negatively impacted by a bill that protected consumers from excessive fees and required disclosures. How do you respond to the executive director of the Greater Baltimore Cultural Alliance, who says there could be serious “unintended consequences” from the bill because it “approaches the rich cultural ecosystem of Baltimore” as a monolith, when it actually includes small venues such as the Single Carrot Theatre and the Baltimore Rock Opera Society? GBCA is a great organization doing wonderful things in our community. I agree that there is a rich cultural ecosystem here, which makes it important to distinguish between the Modell Lyric Performing Arts Center and Single Carrot, or between the Hippodrome and the Baltimore Rock Opera Society. Let’s talk about “kickbacks.” Or put another way, the venues splitting the service fees. Can you explain the extent of this practice? Is this the reason the venues fought so hard against the bill? At the hearing, individuals objected to the term “kickback,” but I would argue that the practice itself is far more objectionable than the term. And the term accurately describes what happens: Ticketmaster contracts with a venue like the Lyric to be the exclusive ticket agent for the venue (and reduces the ability of smaller ticket sellers to compete) for usually a period of two years or more. In return for the exclusive arrangement, Ticketmaster splits the service fee with the venue. At times, these fees may also be split with promoters and others. I understand and support the right of the venue to turn a profit. I also understand that many venues claim that they don’t make any money off the face value of the ticket. If we need to have a conversation about how to support arts venues-let’s have that conversation, but instead, the venues and ticket sellers have simply socialized the costs by placing these costs onto consumers while they reap all the benefits (profits) from this model. A “fee-sharing” system like that one I’ve described that charges consumers excessive service fees and doesn’t explain that the ticket seller and venue both financially benefit from these high fees, is neither a transparent nor fair system. While the venues made a number of arguments opposing the bill, one thing is clear: many have a significant financial stake in the outcome. What’s this about Ticketmaster owing the city thousands for violating the anti-scalping law? How much exactly and why isn’t the city collecting this debt? It is hard to say exactly how much Ticketmaster owes Baltimore City. The penalty for violating Baltimore City’s anti-scalping law is $1,000 per ticket. It would be difficult for me to estimate the number of violations, but suffice it to say that it’s reasonable to think that there were thousands of violations by Ticketmaster – and a great deal of money that the company owes to the city. Most likely it would be the job of the City Solicitor to collect the money from Ticketmaster. We did place a call to the Solicitor’s office but haven’t heard back from them. So, as far as we know, they haven’t moved yet to collect the fines. We certainly hope they do so soon. As we all know, Baltimore City could use the money. Talk about the disclosure provisions of the law. They took out the one to require that notice about the fees be given in advertising, right? They took out more than that. City Council members watered down the disclosures section as well as the right to go to court and reduced the fines for violating the law (from the fines set in 1948). Individuals representing the venues repeatedly stated that they supported disclosure, but claimed that it would be too difficult to disclose these in advertising. Yet a simple line stating that service fees ranging, for example, $7-$25 may apply would suffice. I know of at least two all-volunteer arts organizations that prominently post the ticket fees on the website before you even begin to purchase a ticket. If volunteer run organizations can do this, why can’t venues that have paid staff? And if the venues are serious about wanting to work with consumers, why remove the ability of someone to sue if a ticket seller breaks the law? I would think that good ticket sellers would want to see “bad actors” punished since it reflects badly on the industry as a whole. Why do you think the Council watered down the bill? All the City Council members who voted for the watered-down bill explained that their vote was in the interest of Baltimore City and in support of the arts. But whose interests in Baltimore City is the question? Council members had a clear policy choice and made it. The fact that City Council members did not pass an amendment to reinstate even the original disclosures in the bill speaks volumes of where their priorities lie. Talk about your concerns with the process of how this bill was dealt with by the Council. As a consumer advocate, I’ve participated in a number of state-level working groups which convened a broad set of stakeholders to discuss complex issues and find common ground. The work group convened by the City Council members who drafted the bill did not include stakeholders who represented consumer concerns. Therefore, it is not surprising that the solutions the work group arrived at only addressed the concerns of Ticketmaster and large venues. We were also concerned that despite repeated requests to see copies of the proposed amendments prior to the hearing, we were unable to do so. Couldn’t the bill’s sponsor have insisted that you be included? Who did you contact about this and what did they tell you? As far as I know, there is nothing in City Council rules that requires all stakeholders to be involved in developing bills or amendments to bills. I do think it’s better in terms of public policy to have all those with a stake in the outcome represented at the table and it’s unfortunate that didn’t happen. We reached out after the first hearings and noted we wanted to be included in discussions. We didn’t hear anything about a work-group being formed. We did try to get a hold of the amendments prior to the introduction of the bill. We were not able to do that. Lobbyists were involved, but aren’t they always? Of course. And there is nothing wrong with that. MCRC represents consumer interests in Annapolis on a number of statewide issues. I think that the challenge is making sure that all perspectives on an issue are considered and taken into account.